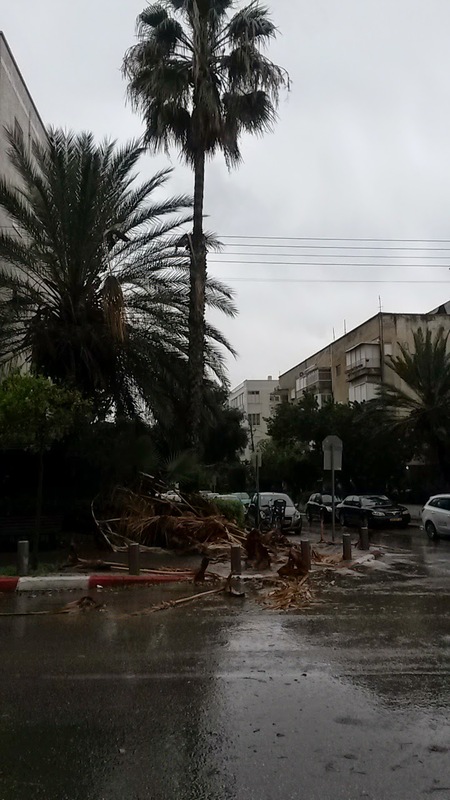 Telaviv1: How I cycled in a sudden blizzard without gloves. How I cycled in a sudden blizzard without gloves. This is a story about my most extreme cycling experience in terms of weather. It was about 2004. I was volunteering once a week at a charity for the homeless funded by David Gilmour of the Pink Floyd, located in Aldgate in East London. My ride home was 15 kilometers and there was a sudden drop in temperature to sub-zero cold accompanied by snow and strong winds. I didn't have any gloves. The snow was so heavy that I couldn't see where I was going, and the lack of gloves meant that my hands were agonizingly painful, so I decided to head to Kings Cross and travel by train. Somewhere on the way to Kings Cross I had a puncture. I remember swearing heavily at my bad luck and trying to remove the tyre with my frozen hands which was very painful. I broke a tyre lever - Possibly the fiberglass couldn't handle the sub-zero temperatures. At Kings Cross I managed to get onto a train going to Finsbury Park. My destination was Alexandra Palace which is a several stops further down the line. Finsbury Park was packed with people trying to find a train, and no trains were going any further than Finsbury Park "due to snow on the tracks". There were crowds of people milling around waiting for a train and it was clear I couldn't get a bicycle on a train and there was no point in waiting. I decided to risk cycling in the cold. Cycling with no gloves in sub-zero weather is so painful that normally you have to stop within a couple of minutes but on this occasion the sudden weather change had resulted in a 5 mile traffic jam which went all the way from Finsbury Park to Muswell Hill and beyond. My entire route was lined with cars which weren't moving but had their engines on keeping the drivers warm. The heat generated was enough to keep my hands warm and get me home. Although my experience was hard it turned out to be better then commuters and drivers who spent hours getting home. In Israel, I have cycled in Middle-Eastern heat waves, but one of the hardest times to cycle is during Mediterranean rainstorms. We get at least one of these rains storms a year. Typically 10-20% of our annual rainfall will drop within a 48 hour period. It quite literally comes down in buckets. 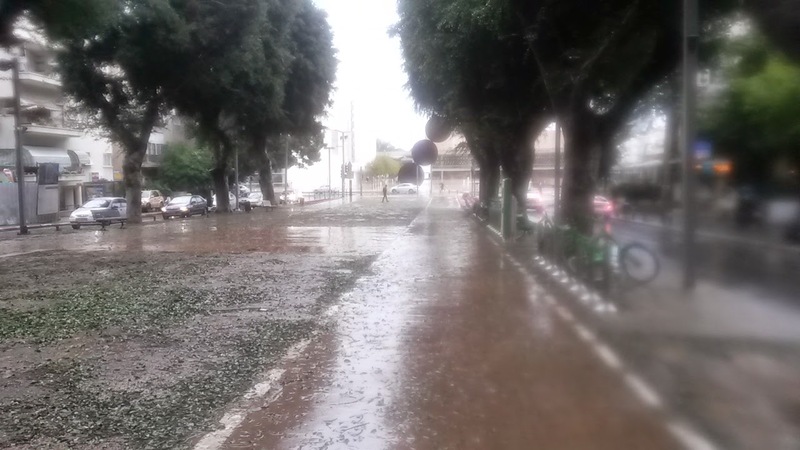 Tel Aviv's drain system tends to get blocked up during the summer and it can't handle the sudden deluge so you find yourself cycling through flooded roads, large puddles while being beaten by heavy rain. I have a very attractive British raincoat, which was great in England but can't handle the Israeli rain. We had one fo these storms this week and I donned two rain jackets, heavy hiking boots and storm pants and rode through the park. 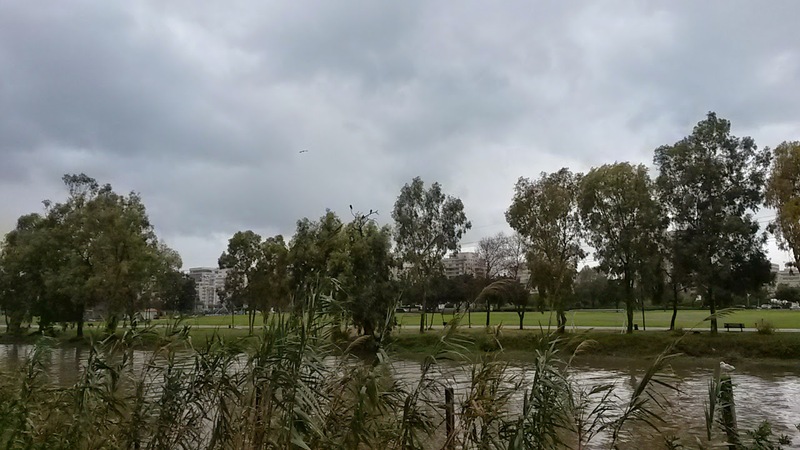 It was wonderful: I was the only human in the Eastern end of Park HaYarkon and passed right next to the Jackals which have now moved into the park, further down I saw two huge herons and a tree with Cormorants. Rothschild Boulevard (my destination) was littered iwth dead umbrellas.